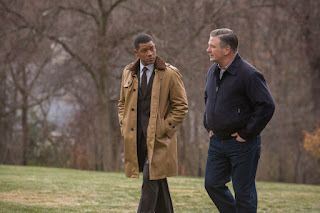 Based on real events, Concussion is the story of one doctor who uncovered the epidemic of head injuries with long-term effects besetting the National Football League. The film is earnest in tone, but also mechanical in execution and only moderately engaging. It's 2002, and Dr. Bennet Omalu (Will Smith) is a Nigerian immigrant doctor working in the Pittsburgh coroner's office. When retired legendary Pittsburgh Steelers centre Mike Webster (David Morse) is found dead at age 50 from unknown causes after having been reduced to a rambling, incoherent man living in a pick-up truck, Bennet performs the autopsy. Not finding any obvious reasons for Webster's inability to function and untimely demise, Bennet doggedly pursues expensive lab tests until he uncovers severe but barely visible brain trauma caused by repeated blows to the head. Meanwhile, in his personal life, Bennet meets and starts a romance with immigrant nurse Prema (Gugu Mbatha-Raw). Supported by county coroner Dr. Cyril Wecht (Albert Brooks), Bennet publishes his findings. Soon he is subjected to an intimidation campaign as the NFL closes ranks and attempts are made to discredit Bennet and his work. But more deaths of former NFL players come to light, including Terry Long, Justin Strzelczyk and Andre Waters, all suffering from similar symptoms and brain damage. Dr. Julian Bailes (Alec Baldwin), the Steelers' former doctor, comes forward to help Bennet publicize his research, but getting the NFL to admit that there is a problem will be a struggle. Concussion benefits from an excellent Will Smith performance, putting on a Nigerian accent and bringing to life a confident, methodical and extremely amiable yet highly principled man. 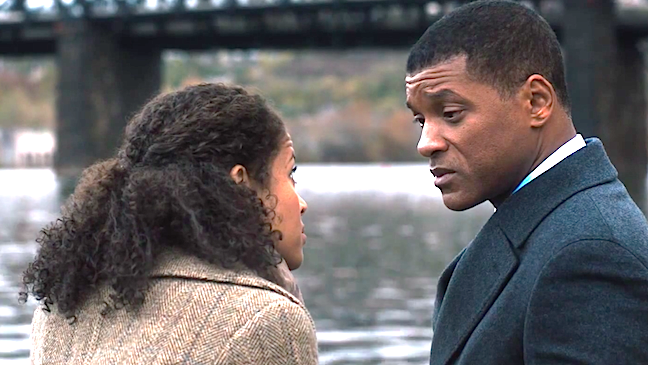 Smith is the main reason to watch Concussion, as the rest of the film barely rises above routine fare. Written and directed by Peter Landesman based on the book Game Brain by Jeanne Marie Laskas, the film struggles to generate drama beyond the obvious. The script is filled with peripheral doctors drifting in and quickly out of the story, barely introduced and adding little punch. There are doctors who validate Bennet's work and co-publish with him (including Paul Reiser in just the single scene); there is an unfriendly colleague at the coroner's office; there are grim-faced officials, experts and quacks at the league offices. None of them stay long enough to register as relevant. Even Alec Baldwin as Dr. Julian Bailes struggles to define his role in the unfolding conflict between the findings of his profession and the interests of his former employers. On the positive side, the romance between Bennet and Prema is sweet and adds texture, two medical professionals connecting more through mutually respectful rationality than infatuated chemistry, Prema gradually revealing her inner strength to cozy her way into Bennet's home and heart. The one other supporting character who rises above the cursory writing is Albert Brooks as Dr. Cyril Wecht, a veteran coroner who sees past Bennet's eccentricities, and recognizes that sometimes medical science has to trump both finances and public apathy. 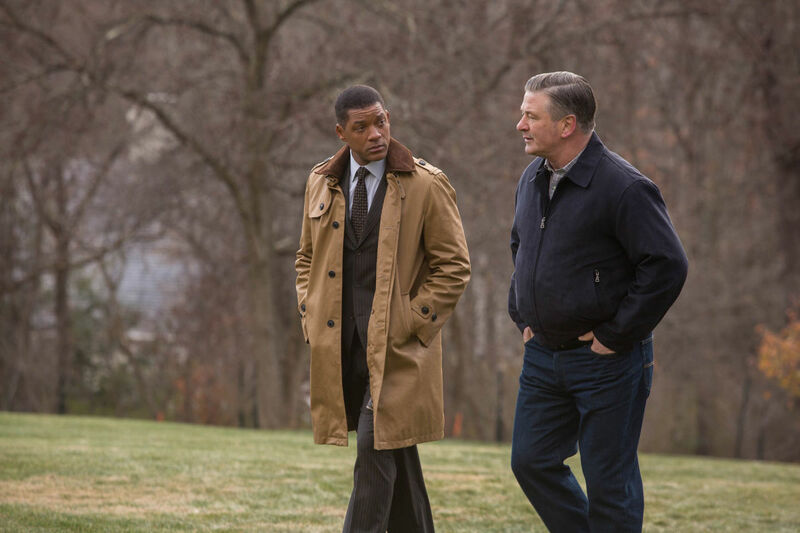 Concussion is well-intentioned and has an important story to tell. It is also rather blandly executed and feels incomplete. Dr. Bennet Omalu is an outsider who dared to reveal the human carnage being caused by a brutalistic sport. But out on the playing fields, brains are still being destroyed as the rabid beer-swilling fans bray for even bigger hits and the crude business of sports-for-profit rolls on.